The Pontefract and Castleford Express has teamed up with First Utility, official sponsor of the Super League, to offer five lucky fans the chance to win a pair of tickets to Castleford Tigers’ next home game against Catalans Dragons on Sunday, May 3. The reverse fixture saw the Tigers leave Perpignan empty handed following a narrow loss to Scott Dureau and company. Cas will be out for revenge at The Jungle… and you could be there to watch all the action LIVE! 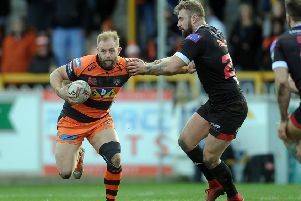 When the two sides met earlier in the season in France, who scored Castleford Tigers’ opening try? Please title the email Catalans competition and note the closing date for entries is Monday, April 27. Throughout the 2015 season, First Utility, the UK’s leading independent energy supplier, will be rewarding Super League fans for their continued support. Fans who switch their gas and electricity to First Utility save on average £229 per year. Visit www.first-utility.com for more information. 2. Winners will be selected from complete, eligible and properly submitted entries before the end of the competition period on Monday, April 27. 3. The package does not include travel to or from the ground or any hospitality at the ground. 4. Entrants are reminded that tickets are issued subject to Castleford Tigers Rugby Football Club regulations and the Conditions of Entry relevant to those tickets. 5. Competition open to all UK residents, over 18 years old, with the exception of employees of First Utility, Castleford Tigers, or Hatch Communications, their immediate families, agents or anyone else associated with the administration. 6. No cash alternative will be offered. 7. In the event of unforeseen circumstances, the promoter reserves the right to offer an alternative prize of equal or greater value. 9. All entrants must be willing to participate in publicity should they be a winner. 10. We reserve the right at any time to cancel, modify or supersede the competition if, in our sole discretion, the competition is not capable of being conducted as specified in the competition rules.